Rick Moore gave up investigative reporting because the collateral damage to innocent people bothered him, but when his boss at MageWire.com promises to use his influence to see that the investigation into charges against Rick’s father are reopened if Rick investigates Griffin Dare’s family, it’s a carrot Rick cannot resist. His father’s whistleblowing destroyed his life while the man who had violated Mage laws, thanks to his connections, went unpunished. That injustice cast a long shadow over Rick’s life and left him suspicious of the privileged class. But one meeting with beautiful, blind Caroline Dare is enough to shatter Rick’s preconceptions about the sheltered daughter of wealthy, well-known parents. For three years Caroline Dare and her parents have maintained their belief in Griffin and their conviction that the stories of his rogue ways are lies. During that time, Caroline has worked hard to move beyond the protective circle of her powerful parents, to claim her independence, and to establish herself as a fiber artist. Her first showing at the prestigious Parkhurst Gallery earns accolades and impressive sales. It also introduces Caroline to a freelance reporter to whom she is immediately attracted, but her wariness of the press is so entrenched that she doubts whether she will see Rick Moore again. Then a prominent art critic questions whether the tapestries displayed under Caroline’s name could have been created by an artist with her limited vision and suggests that they are at best works produced collaboratively with her mother, renowned sculptor Lara Dare. Caroline is hurt and angry, and she’s determined to prove herself. With Rick’s help, she does, and the time they spend together is enough for Caroline to allow Rick into her life and her heart. Just when she is most vulnerable, circumstances show that Rick has betrayed her trust. Can Rick prove he is innocent? Can Caroline forgive his deceptions? 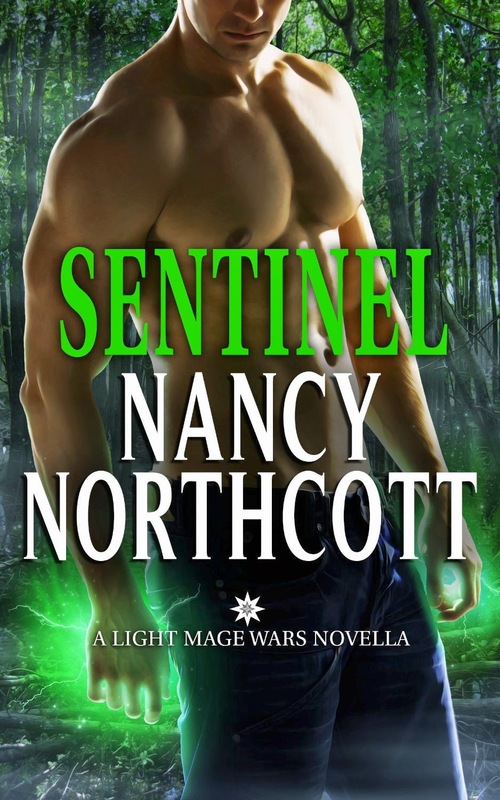 Sentinel is a prequel novella to Northcott’s earlier Light Mage Wars stories: Renegade (Griffin Dare’s story), Protector, and Guardian. Set in Macon, a middle-Georgia city, rather than in Wayfarer, Georgia, headquarters of the benevolent mages in the Southeastern Collegium, located on the edges of the mysterious Okefenokee Swamp, which serves as setting for the other stories in the series, Sentinel is as much mainstream romance as fantasy. The characters in this novella are at home in both the Mundane and Mage worlds, and the focus is solidly on the relationship between Caroline and Rick. Yet Northcott includes enough details about the Mage world to hint at her remarkable world-building skills. Thus, Sentinel has decided appeal for readers of both contemporary romance and for readers of fantasy romance. I am really selective about the fantasy romance I read because much of the subgenre is too battle-centered for my tastes, but I love Northcott’s character-driven stories and her intricately structured world. Caroline and Rick are both complex characters with interesting backgrounds, and, as with Northcott’s other characters, their professions are very much a part of who they are and not just window dressing. I was particularly fascinated by Caroline’s art and the connection between music and her tapestries. While Sentinel can certainly be enjoyed as a standalone, readers who liked the other Light Mage stories will be delighted to learn more about Griffin’s family and his early life. The appearance of Mage lore master, Will Davis, a close friend of all the Dare family, is another plus. He is a fascinating character, and I eagerly anticipate his story, Warrior, which will be published this summer. If you like strong, richly developed characters and plots that keep you turning the pages, I recommend the Light Mage Wars books. Sentinel is an excellent introduction to a compelling series. Thanks for the review. This sounds like a book I will look for. Is it a paranomal? I don't usually read those but this one caught my interest. Sentinel has fantasy/paranormal elements but it's primarily a contemporary romance. I loved it! That was my reaction too, PJ, but I decided to wait until I have Warrior in hand and reread Sentinel, Renegade, and Protector before I read Will's story. I'm looking forward to that. I read Protector in this series and enjoyed it and looking forward to catching up on the others! I've not read any of this series. By the sound of this, I will have to check them out. I like a well crafted story with well developed characters. I do read paranormal stories, but find that tho which are close to reality are most enjoyable.